Today’s church leaders must address this frightening issue. We live in an increasingly secular world. Confidence in organized religion is at an all-time low. The voice of the Protestant mainline tradition has been marginalized. We long to matter more, but fear that our impact is diminishing. Does our vocational life still matter? 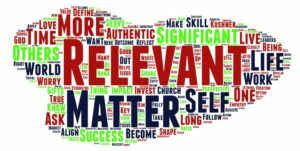 The Oxford English Dictionary defines relevance as “the state of being closely connected or appropriate to the matter at hand.” LinkedIn, the world’s largest professional networking site, says that to be relevant is to provide value that matters on issues important to a target market. If relevance is about mattering, we are bound to ask—What about ministry matters, and to whom? Rabbi Harold Kushner wrote Living a Life That Matters as a primer on the truly important things in life. Kushner argued that everything matters, regardless of how things turn out. No life’s work is wasted if it is grounded in authenticity, goodness and love. I suspect that most of you reading this article would agree with Kushner’s perspective. However, in addition to being authentic, good and loving, most of us also strive to be impactful. We want to be pertinent, to make a difference to the people we serve and to the larger world. We want to be relevant. In the helping professions, we are especially vulnerable to the siren call of relevance. Social media fuel our angst: Kim Kardashian has over one hundred million followers on Instagram. How many followers do you have? Who retweets what you write or preach? Has your blog or Facebook post ever gone viral? When you Google your own name, what shows up? Significance arises from internal alignment. I am significant when “Who I am” and “What matters to me” is aligned with “What I do”. Relevance occurs when I push my impact beyond my inner self, shaping the world’s perspective about my self-of my significance. Success reflects external achievement. It is the recognition I receive when I apply my gifts and skills to achieve a desired outcome. Of these three conditions, significance is the only one that I can fully determine—I can ensure that what I do reflects what matters to me. But relevance can only grow out of significance. If I don’t know who I am, and align that with what I do, then I have no hope of mattering to others. Success is not something that I can manufacture. I can work toward mastery of my gifts and skills, but I can’t control all the factors that produce an outcome. Many of us can work for a long time without measurable indicators of success, so long as we know we’re operating with significance and working to make our efforts relevant to others. Styrlund and Hayes identify four key ingredients for nurturing relevance. These ingredients build on significance. Success may follow (or not). You become relevant to others only through the discovery of your true self, the self that is your God-given identity and fully capable of love; for self, for others and for the world. The key to authenticity is shaping your outer self to reflect your true self. It is only in the discovery of true self that you have an identity to share with others. Relevance requires that you focus less on what you have, who you know, and what others see in you- and focus more on who you are in God. Externally defined success factors can’t shape you. Chisel away at the trivial busyness that threatens to consume your time and become more of the self that God created you to be. Get more in touch with your unique giftedness and make sure that you are operating most of the time from that giftedness. Apply discipline and dedication to developing your skill sets. This may require the mastery of some of the more mundane skills that support your strengths. Then, ask yourself whether the gifts within you are being used to serve others. Learn to be authentically interested in the constituents that you seek to influence. Strengthen your ability to assume their perspective, to understand their unmet needs, and to define what you can contribute to their relevance. This allows you to offer the right thing at the right time. Empathy helps you to matter more. Your talents and resources are finite. You choose where and when to act. Deciding to pursue one option means closing the door on other options. Choosing to ignore the trivial allows you to invest in the significant. This is where you have agency. Only action can propel you into relevancy. We all want to live lives that matter, investing our energy in outcomes valued by others. We long for relevance. Relevance grows when we become more authentically self-aware, develop our signature strengths, engage with empathy and take purposeful action.